There are plenty of different ways you could hold a crochet hook and yarn, but most of the time, crocheters fall into either of two groups: the pencil grippers and the knife grippers. Learn how each method works, as well as how to hold a Tunisian crochet hook. As you try out these grips, keep in mind that these are only the most common ways of working. There are lots of possibilities and variations, so if they don't work for you, keep trying different things to see what's most comfortable for you. When you hold your crochet hook in much the same way you'd hold a pencil or pen, it's called the "pencil grip." The pencil grip gives you the same type of control as you would have when writing with a pencil or pen, or when painting with a paintbrush. In this method, the hook typically works from above and goes down into the stitches. To crochet with your hook pencil style, hold the crochet hook with the thumb, index finger, and middle finger of your right hand (see the left-handed version below). Hold your crochet work and regulate the yarn and yarn tension with your left hand. You can also use both hands to hold your crochet work with some of it in your left hand, and some held with your pinkie and fourth finger of your right hand. If you're a left-handed crocheter, the method for the pencil grip is essentially the same, just reversed. In fact, the photo above is a flipped version of the right-handed method. Because many people who are left-handed hold their pencils a little differently, use the pencil grip that you're most comfortable with. When you use the "knife grip," it's similar to holding a dinner knife. This is an overhand grip that gives you the same type of control as you have when cutting your food with a knife. Knife-grippers often claim that this method is the easiest on the hands; critics claim that it is less precise than the pencil grip. Even if you typically use the pencil grip, you may find the knife grip more comfortable when working with large hooks. In this method, the hook typically works from below and goes up into the stitches. 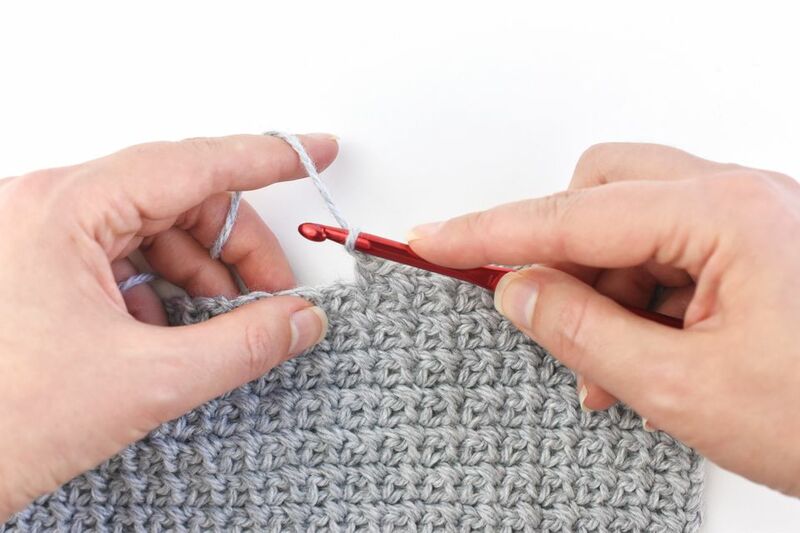 To crochet with your hook knife-style, hold the crochet hook in your right hand with your hand over the hook and with your index finger slightly extended to guide the hook. Hold your crochet project in your left hand while regulating the yarn and the yarn tension. As with the left-handed pencil grip, you can simply reverse the knife grip to learn the left-handed version as you work from left to right. Many left-handed crocheters prefer the knife grip, so be sure to try this method, adapting it as you need to. A Tunisian crochet hook (otherwise known as an afghan hook, or an afghan crochet hook) is different than a traditional crochet hook. These hooks are longer, and they don't have a thumb rest. You don't want to use a pencil grip to hold a Tunisian crochet hook. Instead, use an overhand grip that allows you to manipulate both the hook and the work as you crochet. It's almost like a cross between a pencil and knife grip. When working in Tunisian crochet, let your working hand form a loose, easy fist. The crochet hook needs to be able to rotate and move freely inside the hand. 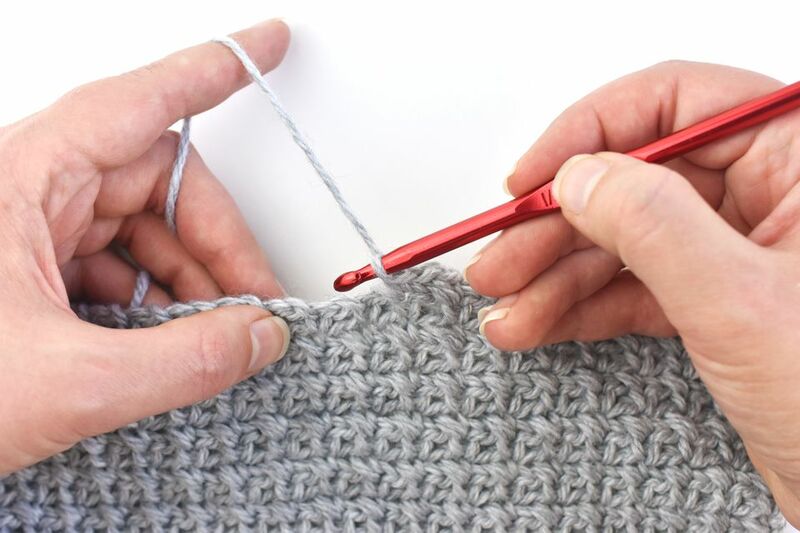 Use your fingers and hand for both manipulating the crochet hook and the work-in-progress, including scooting stitches further in one direction or the other on the hook. When you hold your Tunisian crochet hook in your left hand, once again, reverse the grip from the right-handed method, as shown in this flipped image. Practice your Tunisian crochet for a while, adjusting your grip to find the best method for you.